We thought Sensi was a total badass when all we knew about her is that she's a professional kiteboarder. Then, we learned that she has her own bikini company designed for athletic women, and a passion for/involvement in some really killer organizations. Her pursuit to running an ethically-based, women-focused business (and an all-around healthy and balanced lifestyle) inspires the hell out of us, and we're stoked we got the chance to chat with her about all the things. Thanks for letting us pick your brain, Sensi! You are, of course, a Babe. All the women in my local community. There are so many entrepreneurs and go-getters in our small town. We all try to build one another up and draw inspiration from each other. It’s a magical support system. I love Shazam so I can look up songs I hear while I’m out and about, and Pinterest for endless inspiration. People not silencing their text message tones when they’re in public places (planes, trains, sitting in a park). Those incessant dings drive me nuts! I have two hustles. 1) Running my business, Sensi Graves Bikinis, where I design swimwear for the active woman and 2) as a professional kiteboarder. For my bikini line, I design and create products for surfers, kiteboarders, wakeboarders and more. All of our pieces are made to move, and everything is made in the United States. I love delivering a product that my customers can rely on and that will make them feel good while wearing it. As the owner and designer, I wear every hat in the business, from design and marketing to accounting and production. As a professional kiteboarder, I travel a lot, both for contests throughout the year and on photoshoots for the two main brands I ride for (Liquid Force Kites and Ride Engine). I submit content to magazines frequently and write articles with supporting photos. I also teach kiteboarding at women’s camps. It’s ever-changing. If I’m home and in a routine, I’ll wake up and have a hot water with lemon. Then, I’ll have breakfast (usually eggs and avocado, a smoothie or oatmeal) and settle down at my desk to tackle swimwear projects with my assistant, Victoria. Depending on the time of year, we could be reviewing our production schedule and current line, contacting shops to solicit sales, scheduling our social calendar or planning a photoshoot. I’ll break for lunch and try to sneak in a yoga or barre class. Then, it’s back to the desk to answer emails and put out fires. I’m constantly watching the wind, so if it picks up I’ll drive the eight minutes down to the beach and rig up to go kiteboarding. If I still have energy left at the end of the day, I’ll respond to more emails and plan my calendar for the next day. Otherwise, it’s a home-cooked meal with my boyfriend and a quiet evening at home. When and how did you first get introduced to kiteboarding? At what point did you realize you wanted to pursue the sport professionally? I learned to kite in 2007 when my dad brought my three brothers and I out to North Carolina. I hadn’t even really seen the sport before then, and had no idea what I was in for. After two weeks, I fell in love and kept in touch with the school where I had learned. In 2009, I had the opportunity to move out to North Carolina for the summer to work as a kite instructor, and I jumped on it. From that point on it was live, eat and breathe kiteboarding. The park scene was big at that time in North Carolina, and soon I was starting to hit sliders (imagine snowboard rails and jumps in the water). There weren’t very many women in the scene and as I got better and better, I realized I wanted to compete. I started to, and everything began unfolding. Have you always had a love for the water + outdoors? Where do you think that comes from? Yes! I grew up in rural Northern California. We lived 20 minutes down a dirt road, so suffice it to say, I was surrounded by nature. I loved it. What draws you to kiteboarding versus other water sports? There’s a certain freedom with kiteboarding I haven’t found with other sports. You can explore vast areas of water with your kite and it’s very much a moving meditation. Similarly, do you practice any additional sports? I love snowboarding, surfing and mountain biking. I also practice yoga regularly. How have your experiences in a competitive sports atmosphere affected your drive and work ethic in other aspects of your life? It takes a certain mindset to be a competitor. You won’t make it to the top without countless failures along the way. It takes resilience to keep getting up and trying over and over again. Not giving up is something I learned in competitive sports. It’s the same with owning your own business: there will be good days and bad days. A fresh perspective can help a ton. Just. Keep. Trying. How has your community shaped you both personally and professionally? The kiteboarding community is an amazing group of individuals. Never have I met a more passionate, caring and fun group of people. Kiteboarding is phenomenal in the sense that you can travel all over the world and meet people who are just as excited about the sport and life as you are. It’s a freeing and exhilarating sport that’s very much community driven. Professionally, kiteboarding has given me so much. I’ve built both of my careers within this industry and I couldn’t be more thankful for that. Personally, kiteboarding introduced me to the best friends, expanded my horizons beyond expectation and helped me create a life I’m stoked to live. I encourage everyone to get into it. When + how did you get the idea for Sensi Graves Bikinis? What has that journey been like for you? Sensi Bikinis was born from a need. In 2009, I moved to the Outer Banks of North Carolina to coach kiteboarding. I was in the water every single day. A bikini was my uniform and my recreational outfit, and I quickly became fed up with what the market had to offer. At the time, there wasn't anything that was designed or marketed for active women. There were a few older, frumpier brands, but nothing that identified with what I was: a young, fashion-conscious athlete who wanted to look flirty and fabulous but also be able to rely on my wardrobe for all the fun sports I loved (namely kiteboarding and surfing). I first expressed the idea to few of my clients; women who had started their own businesses. It was simply a whisper at first, and I was hesitant to even voice that desire. But quickly those women, Terre Peck and Isabella Jones, encouraged me to go for it. I remember the simultaneous pull of wanting to try it, coupled with the deep, gut-wrenching fear of failure and being judged that goes along with a new venture. I decided it was something I did want to pursue and soon got up the courage to voice it. To me, once you say you're going to do something, you can't back down from it. Once it was out in the open, I knew I had to give it 100 percent. What makes your swimwear different from the other lines out there? What gap did you aim to fill? Our swimwear is different because we produce and design everything from the ground up with the help of our team of watersports and adventure athletes. Everything is designed with function and comfort in mind. As a professional kiteboarder, I know what works for long days on the water. Designing with this in mind delivers the best product for our active customers. Additionally, we use custom prints, fresh body styles and beautiful fabrics to create pieces that empower our user both in their function and style. We deliver pieces that are beautiful to wear and made to work. We offer suits for a variety of body types (no one design works well for everyone) and we work on delivering the best possible product and the best price point for our customers. Everything is made in the United States, and we use high-quality UPF 50+ fabrics. We don’t package everything in plastic (we use eco-friendly materials) and all of our hang tags, labels and shipping materials are made of recycled materials. Have you always had an entrepreneurial spirit? Did you ever foresee yourself running a business before you had the idea for your line? I've always had a desire to do something entrepreneurial. When I was in junior high I wanted to start a community newsletter, The Leggett Letter. I oversaw my fledgling paper for only a few months but the spark was lit. I've always been very independent and like to see things through. After my mother died, a whole lot of responsibility landed on my shoulders. I think that prepared me for the ups and downs that come with entrepreneurship. 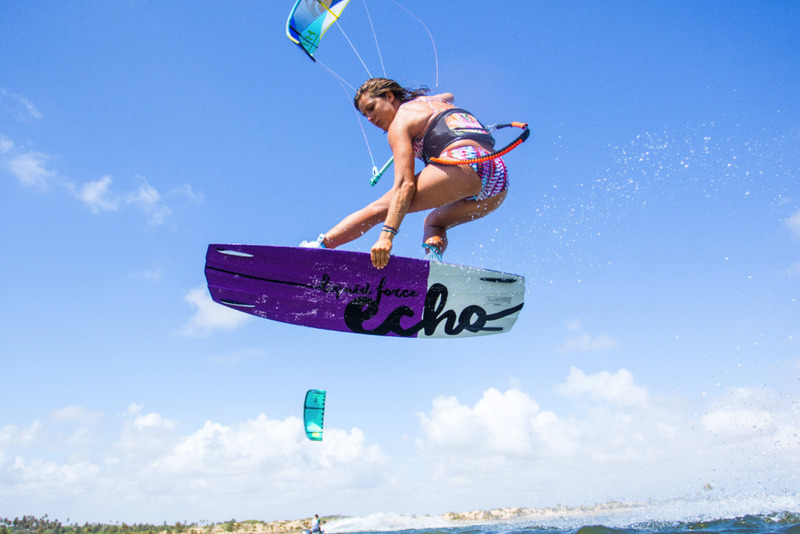 What is the gender ratio like in the kiteboarding world? Do you see it evolving? Running my own business is a constant lesson in staying motivated. Being an entrepreneur comes with having immense ups and downs, and some days you just want to throw in the towel. As a sole proprietor, sometimes my biggest obstacle is myself. Having most of the workload on my shoulders is exhausting and daunting. No one cares more about your business than you do, and that can feel isolating. I am so thankful to be able to create a business I love and provide something beautiful and useful to my customers. I love that I have this opportunity. Reminding myself of our wins as a business, staying true to the vision and looking back at how far we’ve come helps keep me motivated. Having the freedom to pursue what I believe in. The least favorite thing would be never feeling like I can take time off. This month, we’ve collaborated with the Keep a Breast Foundation to donate 10% of sales from our Pink collection to their foundation. I’m really excited about this, because their mission is to prevent more breast cancer and spread knowledge. I love that. My business is also a 1% For The Planet member, which means we donate 1 percent of our sales to environmental groups of our choosing. The best place to start is by interning with a fashion house or other industry player. Start by learning from the pros. There are so many ins and outs in fashion, and hundreds of people who work to bring looks to life. Learning about all aspects of the industry in the beginning will give you a good framework for which avenue you ultimately want to pursue. I’m motivated by delivering a fantastic and beautiful product. I’m motivated by creating a business that is a model for sustainability and that works to inspire other women. I want to spread love and knowledge, and support women’s body confidence. It really is tough being a woman sometimes, and as a swimwear designer I am constantly reminded of how many “perfect” images are being circulated out there. I want to provide a new ideal for women. We want to show women actually doing what they love and push the focus more into self-love rather than self-critique. This is a tough question because success, for many people, is elusive and always morphing. If you’re goal-oriented, for instance, as soon as you meet one goal, you’re on to the next, without pausing to celebrate that win. I’m constantly reminding myself that I am successful already. This mindset keeps me in the present, allows me to practice gratitude and leads to feeling more fulfilled. It’s certainly easier said than done, because our society is so much about chasing the material and always go-go-going, but this is what I want success to look like for me. Being present, happy and engaged in life—now. Work-life balance is tough. You never really feel caught up. I’ve found that the best thing to do is listen to your body and mind. If I’m feeling burned out at my desk and “working,” but not really getting anything done, I’ll remind myself that it’s OK to take a break. I’ll step away from the task, go do something else and come back when I’m feeling it. I don’t know that we should necessarily be striving for work-life balance, but more trying to be engaged in the moment and allowing ourselves to have fun in life. Sign up with your email address, and you'll never miss a Babe! Oct 16 Dear Weinstein, I'm Grabbing Back.